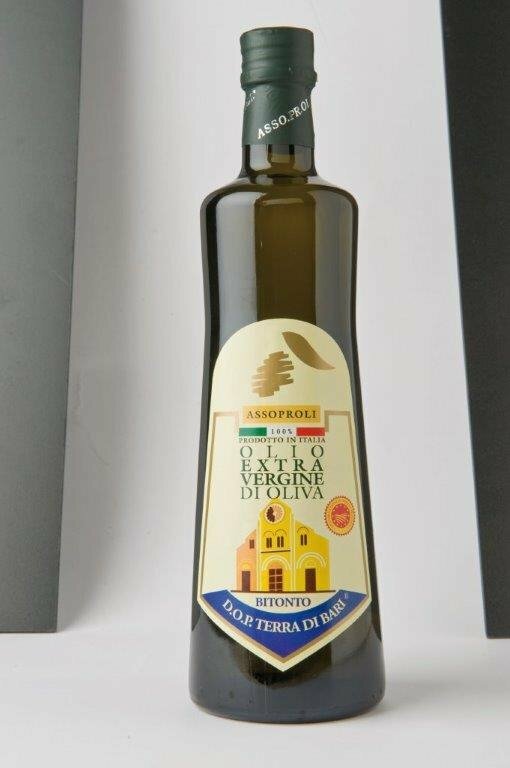 This is an extra-virgin olive oil produced in the central area of the Bari province. This area is called “Conca Barese” (Basin of Bari) and its extra-virgin olive oil preserves its intact fruity scent, with clear notes of fresh herbs and almond and a slight bitter and spicy taste. This oil is obtained from the following olive tree varieties available singularly or jointly in the olive-yards: at least 80% of Cima di Bitonto or Ogliarola Barese and Coratina. Olives are harvested directly from the tree by hand or with mechanical devices. For the olive oil extraction the only mechanical and physical processes permitted are those that allow to produce olive oil avoiding any alteration of the fruit characteristics. The oil must be produced within two days after the harvest. Fish, pasta and rice salads, cooked and raw vegetables.